Have you ever felt an upset stomach after indulging in something you knew you shouldn’t have? Do you get itchy all over after being outside or around something you’re allergic to? Maybe you’ve lucked out in life and have nothing that irritates your stomach or skin. If you’re like nearly 15 million Americans in the world, though, you might’ve experienced a reaction or two somewhere along the way. The thing is, while you can identify and prevent allergies or sensitivities in your life, your dog can’t. They can’t tell you when their stomach is upset or when their paws itch. All they can do is brave the symptoms and hope you take notice. 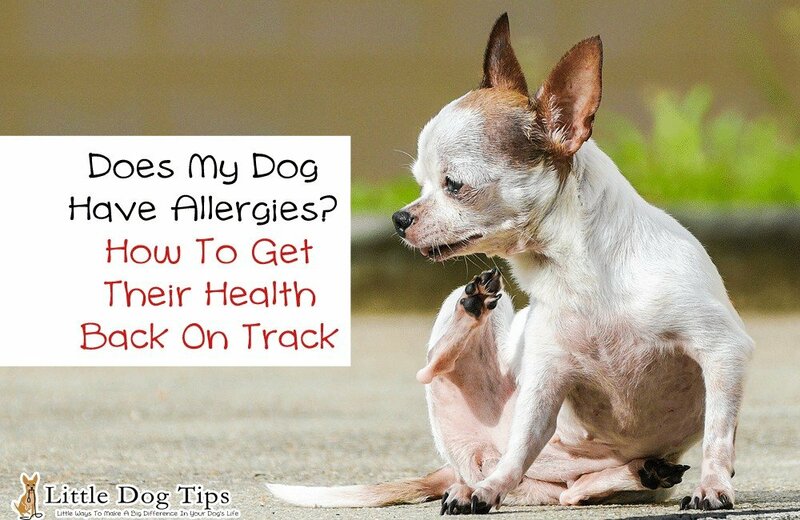 Just like humans, dogs have common allergens. How often does your pup come into contact with the following? The list could go on. The point is, there’s a good chance your four legged family member encounters potential irritants on a daily basis. So what are the signs and symptoms you should watch out for? How will you know if your dog is reacting? The answer to those questions could save your dog a lifetime of pain and discomfort. If you notice your pup exhibiting any of these signs, set up an appointment with your vet. Take notes of anything unusual your dog does so you can have good records of symptoms for the vet to make an analysis. If your vet suspects food allergies or sensitivities, they’ll likely prescribe an elimination diet, which both humans and animals can benefit from. This type of diet is basically a way to pinpoint which irritants are afflicting your dog so you know what to stay away from. Step 1: Choose a dog food with ingredients your pup has never come into contact with before. For example, if you’ve fed your dog chicken and rice all it’s life, opt for something like buffalo and sweet potato. Other alternatives might be beef, salmon, or even kangaroo. Look for carbohydrate sources like potatoes, vegetables, or oatmeal. Step 2: Change your dog’s food over and constantly monitor for a change in symptoms. If rashes, licking, or stomach aches don’t get better over 2-3 weeks, try another food source. Consult your vet when choosing food, as they’ll know what’s best for your dog. Step 3: Once you’ve found a food that eliminates all reactions in your dog, you can opt to start introducing old ingredients one by one, about two weeks apart at a time. By doing this, you’ll be able to pinpoint exactly which food is making your pup react. Of course, you don’t have to reintroduce foods, but it can oftentimes save money and effort on not having to continuously search for uncommon protein sources. Using treats as rewards or ways to prevent excessive licking is a huge part of your dog’s life. When they suffer from food allergies, though, regular trips to the pet store become a bit more tricky. Instead, do a search for naturally made dog treats – preferably not including ingredients like corn, chicken, or “byproducts.” Treats made from organ meat are often a safe and healthy option. While they might not sound all that tasty, your dog will go crazy for them. Another option is to make your own treats and snacks. There are a ton of dog treat recipes out there, but not many that are dog-allergy friendly. Try recipes that are gluten and grain free or made from real meat products – not fillers. Raising a pup with food allergies can seem tricky at first, but once you’ve gone through the steps of identifying the culprit, it’ll be smooth sailing. Stick to the tips above to ensure your dog’s pain and irritation never returns, and plan for a happy and healthy life! Kristen is an avid writer and dog lover. You'll often find her working on a new Ebook, traveling the world, or teaching her own pup, Annabelle, how to behave like a lady. She writes for sites like Safe Bones Co, and you can find her here. Thanks for this fab guest post, Kristen! Cow has struggled with allergies, her tummy gets pink and she’s lost a lot of fur on her chest, but it started clearing up when I eliminated chicken from her diet. It’s tough because a lot of foods that do not use chicken as a main protein include “chicken meal” in their ingredients. Hey thanks for the tips. It’s really informative. But it is always best to consult the vet for proper treatment. I have 2 chihuahuas Gizmo is 6 lbs and Riley is 22 lbs. about 7 lbs over weight. Gizmo is very sick with heart disease and collapse treachea with airway disease and he also has some fluid. He takes heart medicine and Lasix that I have a very hard time giving it to him. I started human food to give meds and Riley wanted it also. Riley has allergies, red belly itchy skin and paws. They use to eat Blue dog food with chicken and rice. Since I stopped the dog food he’s doing a lot better with the hot spots and itchy skin but paws are still itchy and swollen. I wanna get Riley back on dog food and he won’t go near it since I been cooking them lamb, duck, veal and they will not eat chicken. Can somebody help me on how I can get Riley back on dog food and what kind because of his allergies. Riley is also depressed over his buddy being sick. And I don’t know how to give Gizmo his medicine easily as soon as I put the lasix in his food he stops eating. If he doesn’t get his meds he’s gonna die. Please help!! This is consuming my life and causing a lot of depression for me. Thank you BTW I’ve bought 6 bags of dry dog food and 11 cans he smells them and walks away. Hi Tracy! I’m sorry to hear your pups are struggling with allergies and their food. I’d first suggest asking a vet. That would be the absolute best thing you could do for them! Personally, I had to go through about 5-6 different dog foods to find one that wouldn’t make my pit bull react. I finally found a salmon and sweet potato regular dog food that worked (Check the ingredients label on your dog food for chicken by-product. Sometimes, dog foods that don’t say they have chicken still have ground up chicken by-products, which you’ll see on the back label). I wonder if mixing some of what you’ve been cooking them with the dry dog food, then slowly lessening the amount of “human” food over time, would get Riley back onto the normal food. If he just picks out the “human” food from it and leaves the rest, maybe pureeing the human food and pouring it over the regular dog food would help. Again, these are just my personal experiences, so I’d definitely suggest asking your vet. Good luck!!! I wonder if the common allergens are in typical ingredients like chicken, beef, fish, turkey… But most dog food claimed for allergic dogs have the first ingredients made from those. How is it going to be anti-allergy? That’s such a good question. I really don’t know – it’s so hard to find foods that don’t contain common allergens. There are some limited ingredient foods that actually don’t contain those ingredients, like Natural Balance and Zignature.